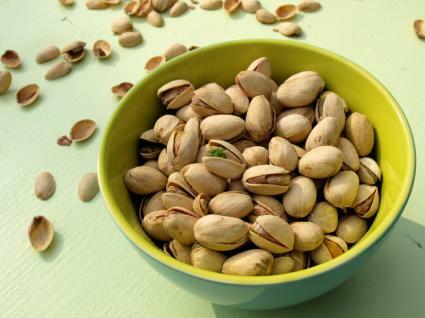 Pistachios are one of the most prized nuts for their culinary qualities, along with almonds, macadamias and cashews. They are not the easiest nut tree to grow at home, but it is possible, especially if you live in the right climate. Pistachios originate in hot, dry regions of the Mediterranean basin and Middle East. Their optimal climate is semi-desert and in the U.S., they are only grown commercially in California and the Southwest. A mature pistachio tree can survive temperatures down to 0 degrees, but younger trees are injured when temperature drop into the low 20s. Any freezing weather in spring can damage the delicate flowers, eliminating the crop for the season. Pistachios need at least 700 or 800 hours of winter chill, defined as the number of hours below 45 degrees between November and March, to flower and set fruit successfully. In the summer they like it extremely hot and dry. 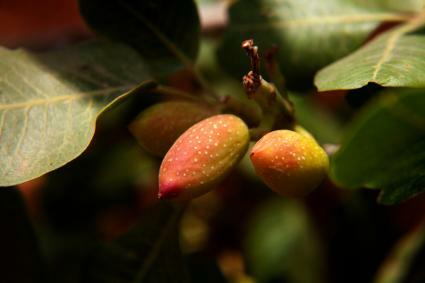 Rain and humidity prevent the fruit, which contains the edible nut, from ripening properly and tends to cause fungal diseases in pistachio trees. In other words, pistachios have an unusually narrow range of climatic tolerance, making them difficult to grow outside of California and the southwestern states. It's conceivable that the trees would grow in the Southeast, but the likelihood of them living long and fruitful lives is slim. Pistachios are always purchased as grafted trees and are generally not propagated by home gardeners because the appropriate rootstocks are not commonly available. There are many genetic varieties of pistachio, but Joley, Kerman and Sfax are the most commonly planted by backyard orchardists. It is important to note that pistachio trees are either male or female and both are required to produce a crop - the nuts are produced on the female trees, while males provide the pollen to fertilize the female flowers. Peters is the standard male variety used for this purpose. Pistachio trees are usually planted as bare root specimens between January and March, meaning they are purchased without soil or a pot during their period of dormancy. They need a location with full sun, the hotter the better. Some gardeners choose to plant pistachios against a south-facing wall to give them extra heat, as well as to provide a few degrees of frost protection in winter. They prefer well-drained soil, but otherwise pistachios are adapted to almost any soil type. There is generally no need to amend the soil, as pistachios are quite at home in lean, rocky soil that is low in organic matter and nutrients. Pistachios grow to 20 or 30 feet tall and wide, so plan the planting location accordingly. Ideally, the male and female trees are planted next to each other, but pollination is generally successful as long as they are within 50 feet. Pistachios are extremely drought tolerant once established, but it is important to provide adequate moisture in the first few years. Rather than watering a little every few days, it is better to water deeply every few weeks to encourage deep rooting. 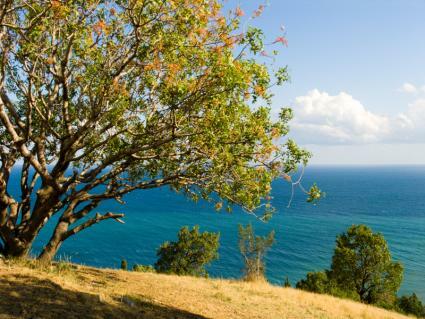 As the tree grows, the lower branches should be pruned off to develop a single-trunked tree with branches beginning four to five feet from the ground. Pistachio trees are often lanky when young, so it's a good idea to support them with a couple stout wooden stakes for the first few years. A 2x2 wooden stake driven into the ground on either side of the tree is generally sufficient. Use rubber ties to secure the tree to the stakes, so the trunk is not damaged. 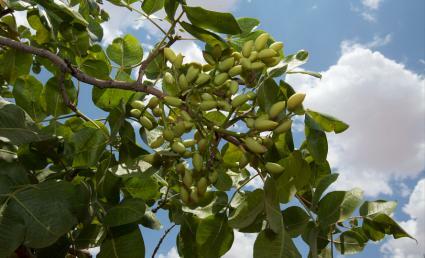 If the climate is right, there is very little care that a pistachio tree needs to thrive and produce well for decades. It is a good idea to maintain a layer of mulch over the root zone and to occasionally thin out the branches that grow toward the center of the tree. Cutting back the outermost growth (12 to 16 inches) of the tree each winter will keep growth compact and favors the production of fruiting wood. In a desert climate, they should be watered deeply every four to six weeks for the best nut production. The best form of pest control in pistachios is prevention, as successful treatment of specific pests by home growers is difficult at best. Fortunately, in the optimal pistachio climate the tree are generally pest-free. A few general recommendations can help. Do not allow weed growth around the trees, as heavy vegetation traps moisture around the trunk, increasing the likelihood of fungal disease. Clean up leaf litter and fallen fruit in fall to prevent the over wintering of pests on the ground. Avoid using overhead irrigation with pistachios, as the wet foliage and bark is more prone to disease. Spread a tarp on the ground to collect the nuts and knock the clusters from the branches with a long pole. Remove the outer husks from the pistachio shell; this can be accomplished by rubbing them over a piece of hardware cloth with 1/2-inch holes attached to wooden frame. Spread the nuts out on a flat surface to dry in the sun for several days. It is a good idea to cover them with bird netting to prevent theft. Store in a cool, dry place in sealed plastic bags. Growing pistachios is all about enjoying the nuts. It takes a fair amount of dedication to get a tree established, but once you do, a healthy tree can provide up to 50 pounds of nuts per year - more than enough to provide for a family and have some left to share during the holiday season.